Do you get tired of hearing the sickeningly cute lullaby songs over and over again? I’m probably a bad mom for saying this but I get tired of listening to them. Silence in my house truly is golden because it’s so rare. So it’s not often I find something I’m willing to play just for the sake of listening to music. 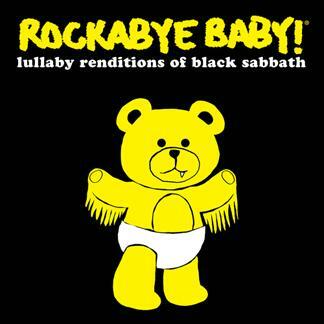 The new lullaby album from Rockabye Baby has transformed Black Sabbath’s music into soothing rock song instrumentals that sound amazing! Even my husband liked it, which is saying a lot. He even said I could tell you how much he liked it! I was provided with a free copy of the Rockabye Baby CD in exchange for my honest review. I was not financially compensated for this review. I always wanted to listen to their Beatles one. OH, thank god for Rockabye baby. their cds are a lifesaver. We have about 13 of them, and im on my quest to get their entire collection. My hubby just loves loves LOVES Bob Marley and Pink Floyd renditions. I remember i bought one on ebay and it came with a coupon or some sort of a flyer for this website, and i’ve been buying from them since. they seem to always be $13.99 and free shipping.